Michael Shane Couch was born in Lancashire near Liverpool England in 1963. He inherited a deep love of the sea from his father, whose Cornish roots spread back many hundreds of years. After school he pursued a career as an aero-nautical engineer for 14 years. Throughout these years, he spent any spare time by the sea. After painting for some years in his spare time, selling largely to work colleagues , by 1992 he began to show in local galleries. Meeting with a good response, he took his work to the Marine Gallery in Cowes on the Isle of Wight where he was warmly received. Striking up a good relationship with the proprietor who actively promoted his work resulted in his embarkation on the unknown path of the professional "Yachting and Historic Marine artist" in June 1994. In 1996 he moved to Cowes on the Isle of Wight, the world famous centre of yachting, where he met his wife, Kathryn. Living and working on the Isle of Wight, surrounded by the sea, inspired Michael where ever he went. During this time, he developed outlets for his work in England and America, exploring new ideas and techniques. 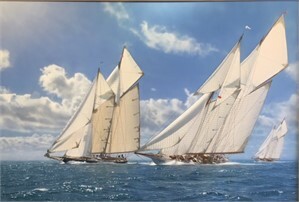 In 1997, Couch was commissioned by the German Yachting Historian, Dr. Christin Lammerting, to depict the German Kaisers Yachts, the 5 Meteors racing together, to be used for her new book, "Meteor". The success of this painting led to a number of other paintings being commissioned and used to illustrate her book. In 2000, he was again commissioned by a prominent London Gallery to produce a series of large paintings to commemorate the 150th anniversary of the America's Cup . 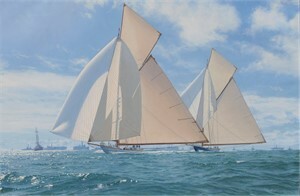 These paintings formed an exhibition at the Jubilee celebration at Cowes. The exhibition was attended by yachtings most influential figures. 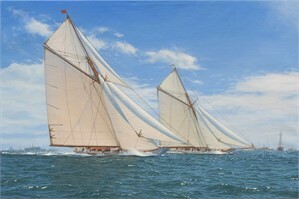 It was a great success and was included in the New York Yacht Clubs commemorative book of the event and was the subject of an article in "Country Life" Over the years, his work has been sold in all the major Auction Houses in London including Christies, Sotheby's and Bonham's. He is currently represented in America by a number of exclusive galleries on both the West and East Coast, including our Palm Avenue Fine Art. The Sea and the action of wind and light over its surface have long been an important part of his Historic Marine paintings. Painting the sea is often a welcome break from the graphic accuracy of the yachts for Michael. He plays with texture and colour as he attempts to recreate this fluid and reflective element. Michael Shane Couch was born in Lancashire near Liverpool England in 1963. He inherited a deep love of the sea from his father, whose Cornish roots spread back many hundreds of years. After school he pursued a career as an aero-nautical engineer for 14 years. Throughout these years, he spent any spare time by the sea. After painting for some years in his spare time, selling largely to work colleagues , by 1992 he began to show in local galleries. Meeting with a good response, he took his work to the Marine Gallery in Cowes on the Isle of Wight where he was warmly received. Striking up a good relationship with the proprietor who actively promoted his work resulted in his embarkation on the unknown path of the professional "Yachting and Historic Marine artist" in June 1994. In 1996 he moved to Cowes on the Isle of Wight, the world famous centre of yachting, where he met his wife, Kathryn. Living and working on the Isle of Wight, surrounded by the sea, inspired Michael where ever he went. During this time, he developed outlets for his work in England and America, exploring new ideas and techniques. 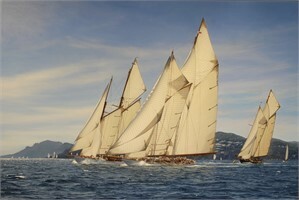 In 1997, Couch was commissioned by the German Yachting Historian, Dr. Christin Lammerting, to depict the German Kaisers Yachts, the 5 Meteors racing together, to be used for her new book, "Meteor". The success of this painting led to a number of other paintings being commissioned and used to illustrate her book. In 2000, he was again commissioned by a prominent London Gallery to produce a series of large paintings to commemorate the 150th anniversary of the America's Cup . 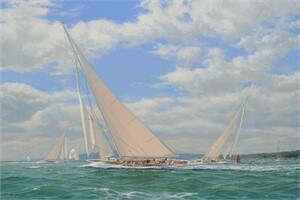 These paintings formed an exhibition at the Jubilee celebration at Cowes. The exhibition was attended by yachtings most influential figures. 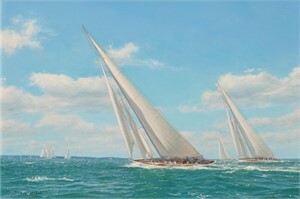 It was a great success and was included in the New York Yacht Clubs commemorative book of the event and was the subject of an article in "Country Life" Over the years, his work has been sold in all the major Auction Houses in London including Christies, Sotheby's and Bonham's. He is currently represented in America by a number of exclusive galleries on both the West and East Coast, including our Palm Avenue Fine Art. The Sea and the action of wind and light over its surface have long been an important part of his Historic Marine paintings. Painting the sea is often a welcome break from the graphic accuracy of the yachts for Michael. He plays with texture and colour as he attempts to recreate this fluid and reflective element.